"The summer that I was six years old my house burned to the ground. My mother died in that fire. I have no memory of that night at all. What I do have is the dream. And in my dream my father set the fire." One of the pleasures of writing film reviews is the opportunity to come across a title that would have undoubtedly vanished into obscurity under the shadow of bigger mainstream releases. Skeletons In The Closet, a project from the husband and wife creative team of Wayne and Donna Powers, is one of those examples. 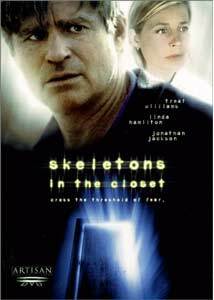 The Powers, who have written hit screenplays for such titles as Valentine and Deep Blue Sea, struggled for almost ten years to get Skeletons In The Closet made. Universal and Warner Brothers had interest at one time or another, but both ultimately passed. Artisan thankfully took the risk on what turned out to be a solid psychological thriller. Seth Reed (Jonathan Jackson) is a troubled teenager living with his father Will (Treat Williams) in rural New Hampshire. We learn during the opening sequence that Seth's mother died in a mysterious house fire when he was only six, and that he has no recollections of that night. It becomes quickly apparent that the relationship between Seth and his father is strained, and that the younger Reed has been in and out of therapy for years, and has been battling drug and alcohol dependency issues. The death of his mother has severely scarred him, and has grown into a lanky, gloomy teen. Stringy-haired Seth has a cute girlfriend named Robin (Schulyer Fisk), and their relationship is also somewhat volatile. Meanwhile, Will is contemplating a romance with co-worker Tina (Linda Hamilton). It isn't until Will begins to suspect Seth's involvement with what becomes a string of disappearances and murders that Skeletons In The Closet turns up the heat. Suddenly, the Powers' script begins to ask that age old question: "How well do you know your children?" Will is forced to doubt himself as he is drawn into what must be every parent's nightmare of having to believe your child is capable of murder. Apparent clues and evidence cross Will's path, and we are never sure if it is all a coincidence or not. To further muddy the situation, Seth appears to revel in provoking his father by presenting him with bits of information that seem to point to his own guilt. As his investigation into his son's activities deepen, Will's very sanity comes into question and raises the question of who the guilty party really is. Wayne Powers' direction doesn't rely on any flashy camera angles or dramatic staging. He simply allows the script to tell the story, and works to keep the audience guessing as to who is or isn't a killer. The three leads are excellent, and compliment each other well. Treat Williams is the film's focal point, and serves as our eyes. He gives another underrated performance here, and his slow descent into paranoia seems realistic enough; his actions come across as completely believable. Jonathan Jackson's dark Seth is the standout here. The suspicious death of his mother has turned him into a caustic wreck, and he struggles to open the "screens" that block his repressed memories. Jackson is creepy and wiry, and we're never sure if he is telling the truth or not. I will confess to a long-standing major league crush on Linda Hamilton, stemming back from her Children Of The Corn days in 1984, and while her character does not have nearly enough screen time for my tastes, she does manage to convey a necessary sense of stability and logic. As with many taut thrillers (how's that for a cliche? ), it is the ending, when all the truths are revealed, that make or break a film. I'm not an ending-revealer, so you can relax. However, Wayne and Donna Powers manage to provide a fairly strong conclusion without forcing the viewer to feel ripped off. Their script doesn't completely fall apart in the last ten minutes as many other half-assed thrillers have done (did I hear someone say Bad Seed? ), and Skeletons In The Closet manages to continue layering on the tension until the final frames. Image Transfer Review: Artisan presents Skeletons In The Closet in a 1.85:1 anamorphic transfer. The print is clean, with little in the way of nicks or blemishes. On the downside, the black levels come across very flat, with no visible depth. This is a recurring problem as shadows appear to swallow characters whole. Daylight scenes look bright and rich, and the flesh tones look balanced. Some compression issues are evident periodically. It's unfortunate that the image transfer for Skeletons In The Closet is marred by murky sequences. Not a total distraction, but noticeable. Audio Transfer Review: Artisan has included a nice 5.1 mix on Skeletons In The Closet. Dialogue is always understandable, and is locked firmly in the front channels. The score dominates the rear channel, and provides an added dimension to this low-budget thriller. Spatial imaging is minimal overall. A 2.0 English surround mix is also available as an option. Extras Review: Artisan has come through with a decent set of supplementals for Skeletons In The Closet. An excellent, feature-length scene-specific commentary track by Wayne and Donna Powers, the film's writer-director team is the highlight. Dominated primarily by the chatty Wayne, the commentary track has minimal dead spaces. Among some of the tidbits revealed by the Powers is the use of a Steadicam to provide the audience an over the shoulder view was done to emulate Chinatown. When Seth drinks from a milk bottle, it is revealed that it is the same type of bottle that James Dean drank from in Rebel Without A Cause. As a movie nerd, I find background information like this fascinating, and helps me to understand how it was important for the Powers to instill subtle parallels between Seth and Dean. Their commentary track is a really nice addition, and boost this disc's worth in my opinion. The biography section include backgrounds on cast members Treat Williams, Linda Hamilton, Jonathan Jackson, Gordon Clapp and Schuyler Fisk. The production team is also featured, with information on not only Wayne and Donna Powers, but executive producer Glenn Gainor, cinematographer Michael Barrett, editor Anita Brandt-Burgoyne and production designer Charlie Daboub. Production notes are available on the disc and the liner notes, and are more informative than most typical low-budget releases. A clean 1.85:1 widescreen transfer of the theatrical trailer is included, as are Spanish subtitles. A full-motion menu, which matches the film's dark tone, completes the supplementals. Skeletons In The Closet is a quiet, disarming thriller that pits father against son. Wayne and Donna Powers have written an intelligent script, and the film features a nice match-up between Treat Williams and Jonathan Jackson. As a thriller, Skeletons In The Closet is more talk than action, without resorting to far-fetched theatrics. A information-packed commentary by the Powers is another feature that turns this into a good rental title to hunt for when the biggies are all checked out.